Tweaks to make Mega Man X6 more enjoyable. Light: Various tweaks without cutting any content. Recommended for a first playthrough. - Beating Nightmare Zero on Lvl. 4 unlocks Black Zero. This is coded in the original game, but the original souls requirements for Ranks/events wouldn't allow it to happen normally (see below). - Reaching Rank UH unlocks the Ultimate Armor. - Cheat Code 1 (Ultimate Armor) now gives both Ultimate Armor and Black Zero. - Both cheat codes can be combined. - Parts are no longer permanently missable. 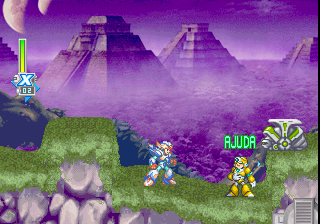 Injured Reploids reappear after getting infected or killed as if you've never encountered them. - Parts allowance by Rank has been edited from 0/0/0/1/2/2/3/4 to 1/1/1/2/2/3/4/4 so you can equip at least one part right from the start. - Rank progression has been edited from to 0/200/300/500/800/1500/5000/9999 to 0/200/300/500/800/1500/2500/4000, so Level 4 boss battle start sooner (Rank PA, 2500), and the newly added unlockables of Rank UH can be reached without excessive grinding. - Story scenes unlocked by reaching 3000 are now split and set to match Rank PA (2500) and Rank UH (4000) respectively. As noted above, this allows you to encounter Nightmare Zero Lvl. 4, which isn't possible in the original game (Lvl. 4 bosses appear at Rank PA, Rank PA requires 5000 souls, but at 3000 souls the game would trigger an event that would make Nightmare Zero not appear anymore). - Dynamo's Green Orbs drops have been increased from 200 to 600 souls (each). If you're grinding souls with Dynamo, you might as well get it over with faster. - X and Zero now share Heart Tanks, Life Up parts, Energy Up parts, Souls, and Rank. - Blade Armor's Mach Dash no longer has a delay at the start, has been slightly slowed down for better controllability, and can be cancelled by moving to the opposite direction, just like the regular Air Dash. - Dash and Air Dashes with the Hyper Dash part equipped have been made a bit longer. - Zero's Sentsuizan has been remapped (from Up + Main attack to Up + Secondary Attack) and it's execution method has been changed to Hold/Release, so you can cancel it anytime. - X's Saber's speed has been slightly increased. - Shadow Armor's Saber can be cancelled by alternating it with dashing, just like the regular one. - Blade Armor's moves deal a bit more damage against all enemies. Complete: A heavier cut of annoyances and other tweaks. Recommended for repeated playthroughs. 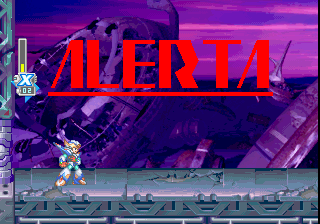 - All injured Reploids not holding any items are marked as "MISSING" at the start of the game, drastically reducing the number of Reploids clogging stages (keeping only the ones that matter). - Disables injured Reploids giving extra lifes. Instead you get a consistenly higher number of lives (from 2 normal/4 with EX Tank, to 4 normal/6 with EX Tank). - Blade Armor's Mach Dash mechanic changed to Hold/Release, with unlimited duration. Can be repeated all you want on a single jump. Deals as much damage as the Nova Strike. - Can now start any air move after a dash jump. 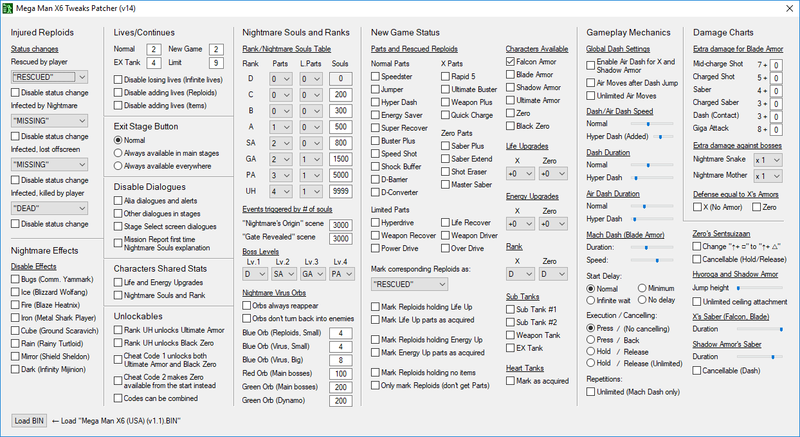 All these options, and others, can be completely customized using the Mega Man X6 Tweaks Patcher. The patch may not reflect all the features currently available. For the latest developments, try the latest WIP release of the patcher. Target: "Mega Man X6 (USA) (v1.1)", "REDUMP" release. - Uber Blade Armor patch now gives you Blade Armor in the intro stage. Just a nice touch. - Completely remade using the v14 version of the patcher. - Completely remade using the v05 version of the patcher. 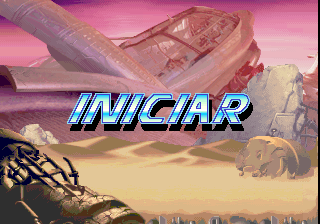 - Fixed a bug on the injured Reploids modification where getting Reploids attacked/killed would glitch their entries on the report list in the stage select menu until you rescued them. Includes STARWIN's EDC/ECC Recalculator and is automatically run during patching. Without this, you may run into problems playing the modified game on real hardware or the more accurate emulators. - (Fix) Blade Armor was broken AF when playing pretty much in anything else besides ePSXe. Now the intended buff works consistently in all platforms (which is actually very subtle, +1 most attacks, +2 the saber). - (Fix) Setsuuizan input was also broken. - (Fix) Cheat Codes could only be combined when using 1 before 2, not 2 before 1. Now both ways work the same. - (Fix) "Orbs won't turn back into enemies" makes them disappear after a few seconds, as they normally do when dropped from infected Reploids (instead of staying in place indefinitely). - (New) Unlockables: Cheat Code 2 can be used to start the game with Zero available. Conditions for related events and dialogues are modified. - (New) Unlockeables: Allow to use both cheat codes together. - Lots of code housekeeping, some of the first stuff I wrote was a lot longer than they needed to be. Hopefully I didn't break anything. - (Fixed) The new "Rank UH unlocks Ultimate Armor/Black Zero" option would cause a rescued Reploid to glitch out when loading a saved game. - (Fixed) "Nightmare's Origin" souls code had been broken on the last few version, making it play more than once. - (New) Make Nightmare Soul Orbs always regenerate. - (Fixed) A rewrite in the Events/Souls option caused a game-breaking bug which affected Zero's saber. - (Fixed) Unlimited Air Moves related options are now listed and described correctly. - (Fixed) Hyper Dash speed controls were not working. - (Fix) Too much to list. Both stuff that's been reported and stuff I found before anyone noticed. - (Improvement) Now the "Characters Available" section doesn't clash with cheats at all. Secret characters added by cheat code should stack with the patcher's option with no problems. - (New) Various general Dash modification, including: enabling Air Dash for unarmored X and Shadow Armor, allowing air dash after a dash jump, unlimited air moves, and varios duration/speed controls. - (New) Blade Armor's Mach Dash customization, including: delay options/removal; execution and cancelling options such as being able to cancel it by pressing the opposite direction (like the regular Air Dash works), and control by hold/release, including the very abusable unlimited variant. - (Fix) Blade Armor Air Dash delay removal: SFX now plays correctly. - (New) Blade Armor Air Dash delay removal: Added an option, "Minimum". Normal delay, except it doesn't wait for you to let go of the button. - (New) Defense: Give normal X and Zero the same defense as X's armors. - (Fix) Shared Souls and Rank would cause the Souls explanation on the Mission Report screen to be skipped (even if the option to skip it wasn't selected). - (New) Contributions by Z3R0X: Hyoroga and Shador Armor's jump height, and X's saber duration. - (New) Contributions by injoon84: Be able to cancel Shadow Armor's saber with a dash. - (New) Added input modification for Sentsuizan. Thanks to Z3R0X for this contribution! - (Fix) Using any of the New Game Status options would break the use of cheats to get Ultimate Armor or Black Zero (the value gets rewritten). It's changed so it's only affected if a "Characters Available" is selected (which effectively rewrites whatever is set by the cheat). Using other any other part of the patcher besider this one will keep the normal cheat codes functional now. - (Fix) Also related to "Characters Available", fixed Falcon Armor not being disabled when unchecked. - (Fix) Some individual Parts wrongly assigned. - Added some additional notes. - (Fix) "Shared Nightmare Souls and Rank" was causing a freeze in the Mission Report screen (detected on PSP). It should work ok now, on PSP and everywhere. - Complete rewrite. Added a bunch of new options, and bug fixes of previous ones. - Initial testing for some of a couple of new options. An XLSX spreadsheet with all the address, values and ASM modifications to do everything the patcher above does. So awesome, this game will be so much better now, thanks. Whoa, this is fast! I thought of pm you. 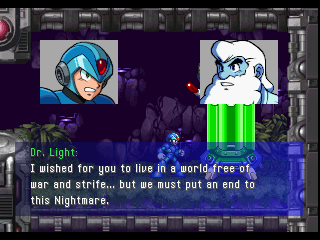 I haven't finish writing my gameshark but you already post a modded Megaman X6. Note: The one mark* doesn't have effect even if they are equip. Note: Weapon select screen will becomes glitchy once you include X/Zero only parts. Before I start, I want to share my personal preference control button so that you understand why I choose those Joker Command value for specific cheats. Mugshot will remain the same as the initial chosen character. Falcon, Blade, and Shadow can have 3 transformation although their Ultimate sprite is glitchy. No harm though. To reset back to initial chosen character, release Up/Down but hold Select button once the animation started. There will also be glitch if you activate this code during conversation. Try it and you will know what I meant. Also, you might want to include Black Zero transformation. However, in doing so you might risk of not able to collect any remaining armor parts. Therefore, you might need to add another code. Then to turn back to Red Zero. This is only for Ultimate armor. Why Left button use Max Reverse Joker? Well, my keyboard not supporting it. Infinite float down slightly slower than normal. Shadow can now pass impossible stage like Amazon Area 2. Also, Shadow can slide down the wall at will. Other characters can slide down the wall faster. Blade can perform super slow straight down air-dash. Characters that can air-dash able to perform diagonal down air-dash. All characters can do squat little jump tricks, and jump kick down the wall. Very cool. I like this. Infinite float up slightly slower than normal. All characters can slide up the wall. Blade can perform super slow straight up air-dash. Characters that can air-dash able to perform diagonal up air-dash. Shadow and Zero will suffer performing using this codes because of their super jump moves. I don't like it. Kind of kill of the fun for platforming games. I think that will do. The rest is a repetitive of basic gameshark value with Joker Command. I hope this gameshark will end up helpful and thank you. I'm gonna try your game soon. 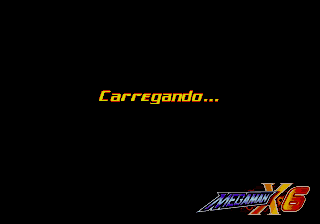 This is so cool I'm translating Megaman X6 into Brazilian Portuguese and i'll apply this improvement tweak from Nightmare Zero Lv04, thanks! You already have my like and my download on this tweak patch. Thank you so much for doing this! Always thought X6 deserved some fixes and improvements. These tweaks are amazing and they make the game so much more approachable. I really like the tweaker program and the documentation. Do you have more plans for X6? I have some ideas: remove the nightmare system; make collected heart tanks apply to both X and Zero. I wish I had the reverse engineering skills to implement these ideas and contribute. 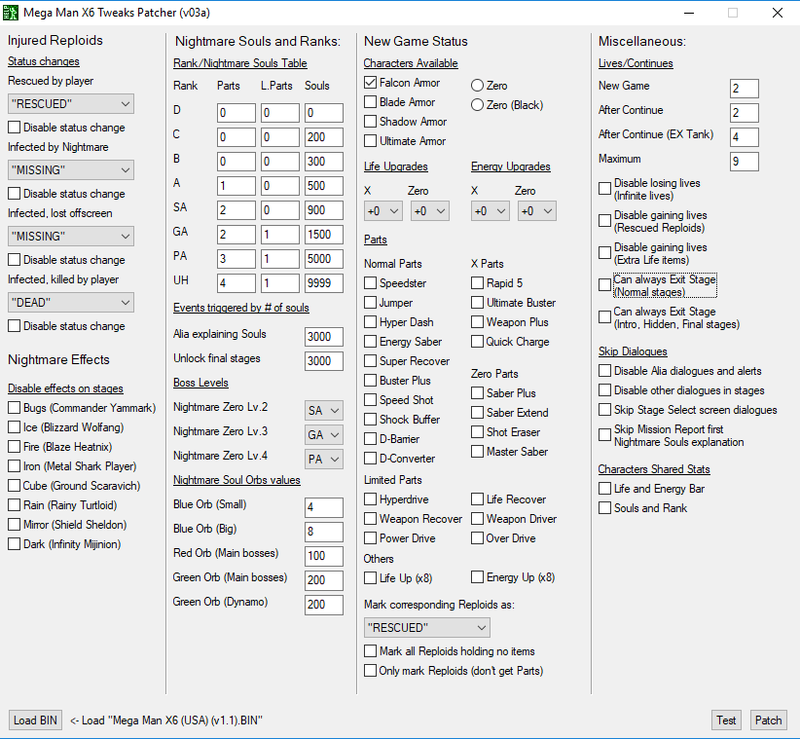 I have try your Mega Man X6 Tweaks Patcher (v01). I like the idea very much. It let us customize to our liking. No more dispute among us. Hooray! However, it seems like some selection not working accordingly. Seems like there will be glitch on the Rescue File if we activate this one. Some Japanese words there. Correct me if I'm wrong. This suppose to disable us from getting extra live from the Reploids that been rescued right? Well, it's not working. Each Reploids still give 1 extra live. The rest seems to be functioning. I think? I hope there will be more selection in the future. Regarding assigning new actions to button presses, maybe you should get some advice from this guy. You mean the list of rescued reploids in the stage select screen? I never encountered this, I'll have to check again. This was working on the BIN I patched for testing. Then again the operation for giving lives seems to be in more than one location of the BIN, so there's probably additional changes I need to make for it to work in all cases. I'll take another look. Also thanks for all the additional addresses you've provided! Those two ideas are on my wishlist too at the moment, I'll try to figure out how to implement them. But first I need to spend some time making sure everything already included is working as intended. This is the first release and I'm just starting to get some feedback. And as you see in the above post there's already a couple of things that need fixing. When using the patcher, I chose to have the reploids that don't give anything auto-resuced but, It also rescued the reploids that gave common parts. Also, do you have any plans to add the ability to edit the damage chart? When using the patcher, I chose to have the reploids that don't give anything auto-resuced but, It also rescued the reploids that gave common parts. NEVERMIND. I did have this problem now when running the game on a different emulator. Thanks for reporting it. Something I didn't notice until I ran this on mednafen: depending on the options selected, it may be necessary to recalcualte ECD/ECC fields for it to work properly on hardware and on more accurate emulators. If you run into an uenxpected freeze, try running your patched bin through STARWIN's EDC/ECC Recalculator. It's a simple drag-and-drop process. Now that Black Zero is available in game I’ll most likely be using the Ultimate Armor X code, however I believe it replaces the Falcon armor, it would be nice to be able to have both. This time I play around with the Mega Man X6 Tweaks Patcher (v02) and this is the results I get. Also, count me out from testing from the time being. It's tiring. Anyway, I used ePSXe 2.0.5. 87/88 reploids. Missing Leon from Northpole Area. Suppose there is only 10 reploids but 1 reploid name Leon from Northpole Area also included making it 11 reploids. Once you reach higher rank, your rank will not drop even if you set lower rank with higher souls needed. eg. Rank A needs 1000 souls but rank UH only needs 10 souls. Once you collected 10 souls, your UH rank will not drop even if you collected more than 1000 souls later. It won't acknowledge lower level boss for higher ranks. eg. Rank UH for Nightmare Zero lv.2 and rank A for Nightmare Zero lv.4. If this happens, you will have lv.4 boss no matter which ranks achieve first. a) This event only triggers if you clear a normal stage with enough souls collected. b) If you collected enough souls but exit the stage, this event will not trigger. c) In the original version, with enough souls collected, Alia will explain souls by just exit, clear a normal stage, or defeating Nightmare Zero. High Max not included though. a) If you clear a normal stage with enough souls collected, Alia will explain souls. Then, Gate event will trigger and enable Final Gate's Lab 1.
b) If you exit with enough souls collected, Alia will not explain souls. Then, follow by Gate event and enable Final Gate's Lab 1.
c) By setting the number of souls needed higher than 4), Alia might explain souls thrice by triggers 4a) twice with both X and Zero, then again on 5a). X will not show any extra lives available. It's working now but it also disable us from gaining extra lives from X/Zero helmet that provides extra lives. That's weird because when I used gameshark I posted above, both codes only disable extra lives from reploids. I used below gameshark to test it as it's hard to get extra lives by defeating enemies. Nope. You will still be able to keep the Falcon armor but starts the game as Ultimate armor. Only X5 disable you from keeping the Fourth armor if you activate the Ultimate armor code. Seems like you mix up your memory between X5 and X6. Thank you so much for your testing! Also thanks for confirming this feature is currently working ok in ePSXe. Next version will include a fix that makes this work consistently on Mednafen PSX/hardware too. Triggers by # of souls are intended to be put in ascending order, I put a warning about this on the description. That's the way it needs to be because of how the game reads it (it compares your current souls number with the reference table from highest to lowest, and stops once it finds a match). Rank based triggers COULD be implemented out of order (the game reads the level from a separate byte for each corresponding Rank), but for simplicity's sake I decided to automatically adapt non ascending orders from highest to lowest when using the patcher. If for some reason anyone wants to make it out of order, the addresses for said table are in the spreadsheet. I didn't do any testing using Zero, so I didn't realize this got triggered separately for both characters. Probably more trouble than it's worth, but I'll give it another look just to see if there's something I can do. For the moment, I may leave this one out of the base patch on the next version. Similarly, I made the lives counter disappear on the pause menu when increasing the limit of lives above 9 because displaying double digits for lives in the pause menu causes graphical glitches. Both of these changes are detailed on the spreadsheet. Thanks, I was about to get into testing what effect this had on regular 1-ups items. I'm gonna compare my modification to your gamesharks to test it further. Ideally, I'd have them both be set as separate options in the patcher... (I actually forgot this game had regular 1-ups). Have a free bump so you can post your updates on a clean post. Here's a sneak peak/beta of the next version. "Reploids / Status marked by default" is completely fixed, now it works as it should on hardware, Mednafen PSX, ePSXe, etc. Also, number of lives "after continue" now also applies to the lives you start with when loading a savefile. I haven't fully tested some of the new stuff yet, so I won't release it on the site just yet. But here's a temporary download link if anyone wants to play around with it for the moment, an alpha of sorts. Just make sure you start a new game if you plan to try any of the "shared stats" options. Uh, I'll send you a PM. Nice addition as always. The latest patcher (v03a), not sure these are mistakes or not. Rescued Reploids give 1 extra live but not from Extra Life items. Extra Life items give 1 extra live but not from rescued Reploids. Shouldn't it be the other way round? I mean swap between these two codes. Plus, aren't you missing the Common, X, Zero, and Limited Parts? I only have Gameshark value. Maybe you're trying to separate it nicely. But, it's not going to get all parts if you combine it all together. At least that's what happened when I used Gameshark. By the way, for X and Zero sharing the Life Up upgrade, does it have anything to do with the below gameshark? It it does, then, these codes may help you making X and Zero share Weapon Energy Up. I just retrace back this codes. Not sure if there's any bug on it. I wonder why I deleted these codes. Maybe because X5 Zero Weapon Energy gauge is buggy. But now that you provided the address where the values are registered, I can try to to implement it separately! By the looks of it, the entire collection is registered the same couple of bytes (by using different multiplies as different items and adding the value up) so replacing the whole value replaces the whole collection (with one gameshark code after the other). Try adding up the hex values instead. The byte that registers your current subtanks works the same. I will try to do the same for the weapon upgrade for the next release though. I just ran out of time last night. Your addresses have just confirmed that weapon upgrades are indeed separate values just like the life upgrades. I didn't remember that clearly. Just notice another bug when try to play the game. If X and Zero share soul and rank, the rank will not increase even though Alia reporting rank improvement. It somehow freeze the rank. Since X started the game as rank D, the game will stay at rank D.
Can you describe me step by step how to reproduce the problem? It' working fine here, so you're probably doing something differently than me. Remember to not reuse save sates taken from different bins. By the way, I've been working on some new options over the weekend. - Missing stuff from the previous version (shared Energy bar upgrades, Red Orb values) and fixes (swapped "disable losing lives" options). 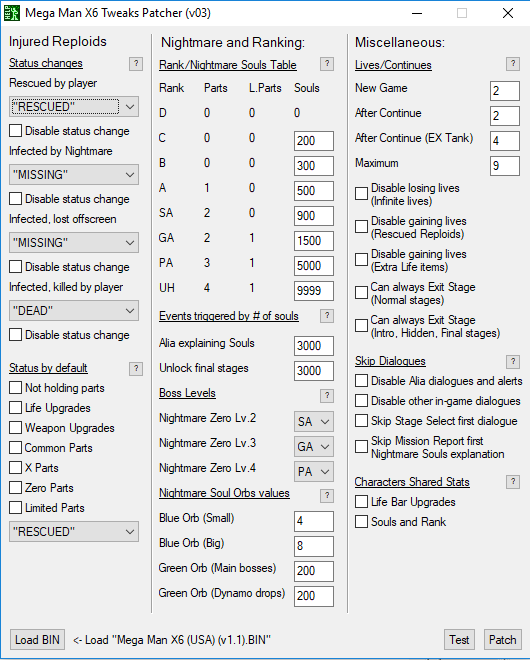 - Nightmare Effects: you'll be able to disable them (individually, or all of them). Can someone confirm if any of these is needed to access an item or injured reploid, or is it safe to just disable them in all cases? I'm thinking of adding this to an alternate version of the base patch. - Customizable Ranks table. Not just the Souls requirement, also how many parts can you equip on each rank. - The "Mark injured reploid as rescued by default" section is gonna be rewritten into a complete list of Parts you can individually select to start the game with (which will mark the corresponding Reploid as rescued). All the hacking is done, now I just need to implement all these new inputs into the patcher.